In Miami's Margaret Pace Park, a water fountain with a message. Dara Schoenwald says she proposed the water station to 'start a conversation' about plastic waste. WLRN's Christine DiMattei interviews VolunteerCleanup.org Executive Director Dara Shoenwald about new water purification kiosks planned for Miami Beach. On a scorcher of a day at the beach, there's almost nothing like reaching into your cooler or a beach bag and taking a swig out of an ice cold water bottle. But if they're plastic, all those little bottles add up. It's estimated that 60 million plastic bottles are used in the United States every day, with many of them going unrecycled and ending up in landfills and in the ocean. But in Miami-Dade, a non-profit is enlisting the help of some old-fashioned technology in the fight against plastic waste: the water fountain. Or “water bottle refill station,” as VolunteerCleanup.org likes to call it. Armed with a small grant from the Miami Foundation’s Miami Public Space Challenge, the non-profit’s executive director, Dara Schoenwald, proposed a station for Margaret Pace Park near downtown Miami. The ADA-approved drinking fountain has side faucets for filling personal water bottles. A message on the front of the fountain reminds users how many plastic bottles are ending up in the ocean. “I was awarded the grant as a proof of concept and to really start a conversation about the wastefulness of drinking plastic bottled water,” says Schoenwald. 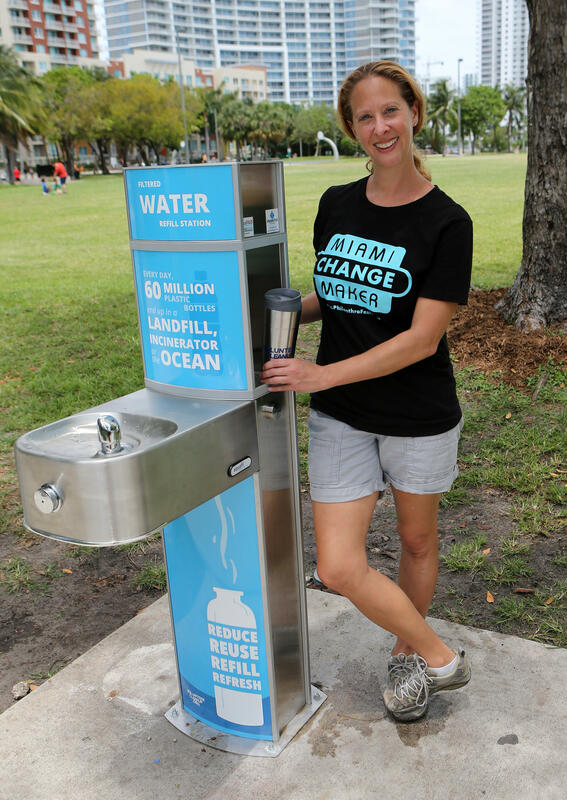 But once the word of Schoenwald's project spread, an Israeli company called Woosh Water contacted her organization about going even further: the installation of 25 high-tech water purification kiosks throughout Miami Beach. Schoenwald calls the stations “super cool high-tech” and “Citibike for water.” The water stations are digital touchscreen kiosks that not only dispense water into personal bottles but rinse and disinfect the bottles. The technology taps into the local municipal water supply and uses an ozone-based method of purifying the water on the spot. An electrical connection makes sure the water is always ice-cold. Cost to the city of Miami Beach? Nothing. “This is run as a concessionaire type of agreement,” says Schoenwald. The first 25 stations planned for late fall will be installed and maintained by Woosh Water. A swipe of a credit card will get you up to 20 ounces of water for about 50 cents. There are also subscription plans for $5, $10 and $20 dollars. For Schoenwald, one of the coolest features of the water station is the information that pops up on the touchscreen with every use. Is Floatopia Aftermath To Blame For Beach Litter? Floatopia is a biannual Miami Beach floaty party that's now causing trouble with Beach officials who say the event leaves behind too much of a mess. The event, which was brought to Miami in 2012 by a group of anonymous volunteers, is organized through social media. Floatopia began in California in 2004 and also takes place in Palm Beach County. 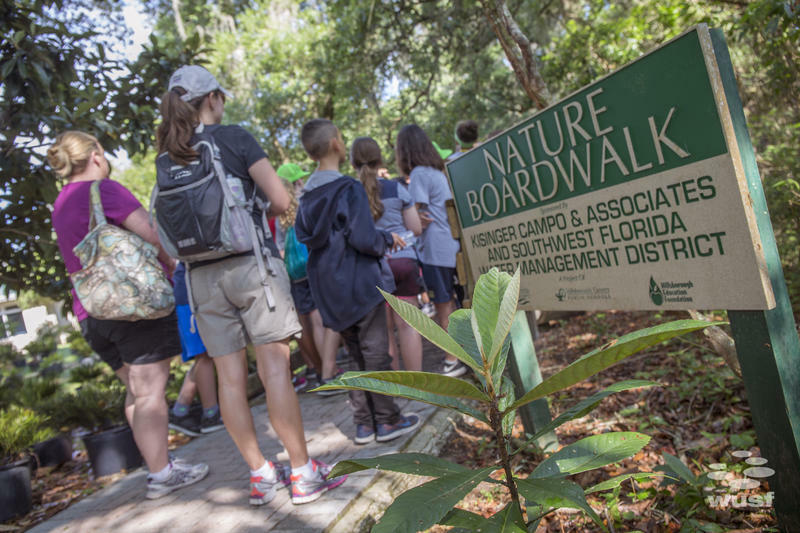 Hillsborough Students Get Lessons In The Environment At "Nature's Classroom"
How do you teach kids about ecology when the natural world is shrinking around them? In fast growing Florida, one solution is to take environmental studies outside the walls of a classroom.